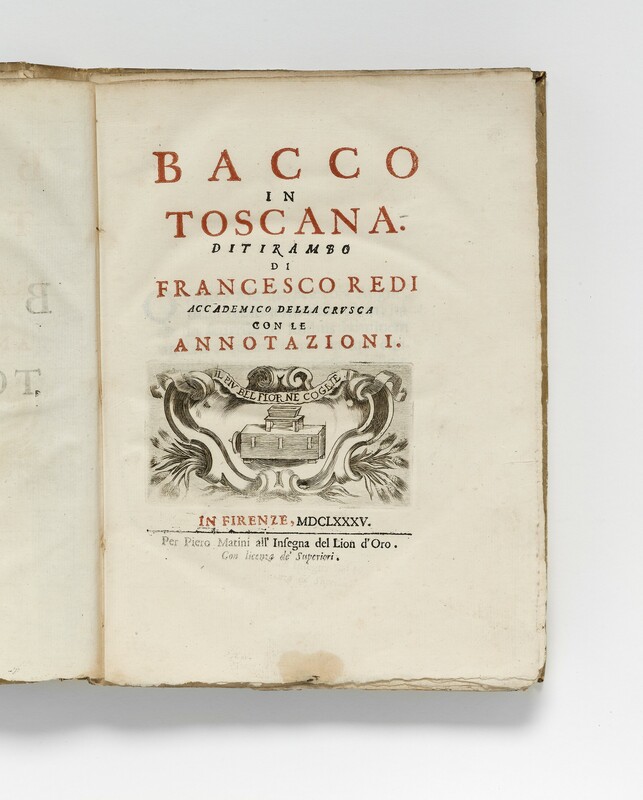 First edition of “Bacchus in Tuscany”, a dithyrambic poem of a thousand lines, begun in 1666 and finally published in 1685 with copious annotations. The poem recounts the passage of Bacchus through Tuscany, accompanied by Ariadne, satyrs, and bacchantes, during which a number of local wines are sampled and evaluated, as well as other drinks such as tea, chocolate and coffee. The work is “one of the most famous panegyrics on wine ever written” (Simon) and was reprinted in at least forty-one editions. Bacco in Toscana. Ditirambo di Francesco Redi Accademico della Crusca con le Annotazioni. quarto (265 × 195 mm), (160) ff. signed π4 A–F4 A–Z4 Aa–Kk4 and paginated (8) 1–46, (2) 1–264. 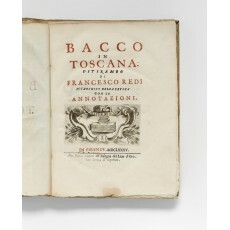 Title printed in red and black with engraved device of the Accademia della Crusca. provenance inscription on endpaper recording the author’s presentation of this copy to Paolo Rucellai1 in 1690 (partly effaced) — later inscription John Ingilby2 — sold by Bonhams, ‘Books from the library of Ripley Castle, North Yorkshire, sold by order of Sir Thomas Ingilby Bt’, London, 1 March 1995, lot 460. Light stain in lower margins of initial two quires, tear in margin of folio E4 with early repair, otherwise an attractive, untrimmed copy, in very good state of preservation. 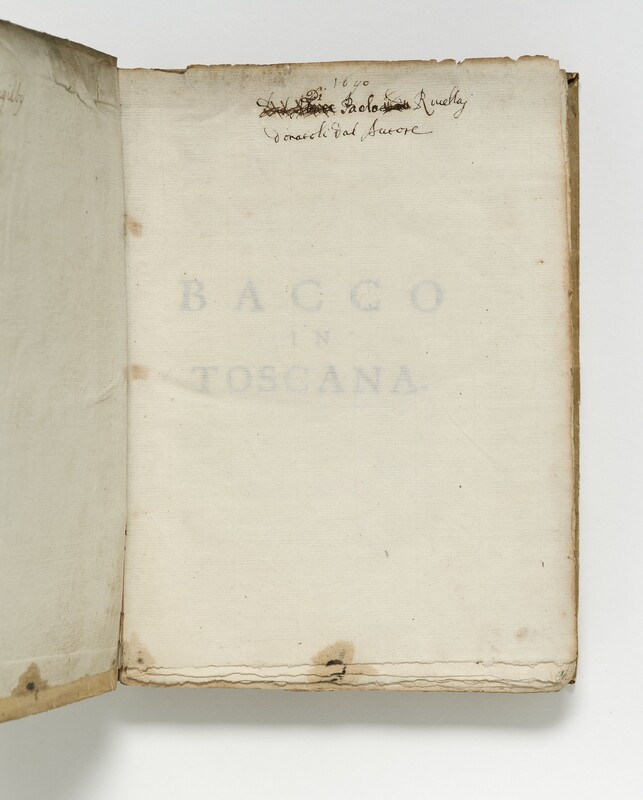 binding contemporary flexible vellum; back lettered in a contemporary hand Bacco del Redi | 1685. 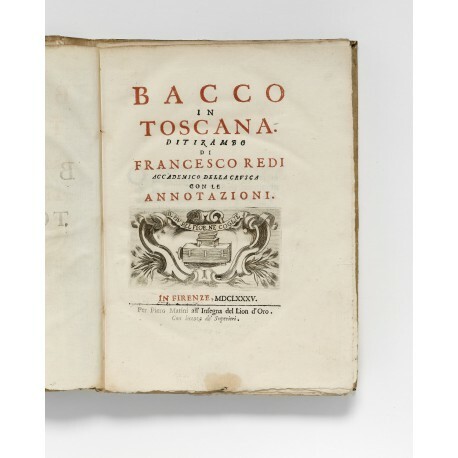 First edition of ‘Bacchus in Tuscany’, a dithyrambic poem of a thousand lines, begun in 1666 and finally published in 1685 with copious annotations. The poem recounts the passage of Bacchus through Tuscany, accompanied by Ariadne, satyrs, and bacchantes, during which a number of local wines are sampled and evaluated, as well as other drinks such as tea, chocolate (pp.29–33), and coffee.3 The work is ‘one of the most famous panegyrics on wine ever written’ (Simon p.121) and was reprinted in at least forty-one editions (Prandi). The author graduated in philosophy and medicine at Pisa in 1647 and became head physician at the Medici court and superintendent of the ducal pharmacy. 1. Either Paolo-Filippo Rucellai (1654–1723) or Paolo-Benedetto Rucellai (1657–1734); see Luigi Passerini, Genealogia e storia della famiglia Rucellai (Florence 1861), pp.156, 161. 2. Probably John Ingleby (circa 1705–1772), only son of Sir John Ingleby, succeeded his father as 4th Baronet, travelled in Italy in 1728–1729. 3. Richard von Hünersdorff, Coffee: a bibliography (London 2002), pp.1232–1233. 4. Line 358 in the critical edition by Carmine Chiodo (Rome 1996), p.131. 5. British Library, shelfmarks G.18224 and 84.e.9; British Library, Catalogue of seventeenth century Italian books (London 1986), p.726.